It’s been an odd year for former NBA player and coach Jason Kidd. A student of the game of basketball, who played it from his youth through college and 19 professional seasons before jumping right into coaching just days after retirement, J-Kidd is currently on the longest hoops hiatus of his life. After parting ways with the Milwaukee Bucks in January, it’s been two months and counting away from the game for Jason, and it’s certainly been an adjustment for him. But Jason has settled into a new, if not temporary, phase of his life, and a new home in Phoenix (where for the first time, he was actually a part of the move from city-to-city). He recently told Bleacher Report’s Howard Beck that the hiatus has been good for him, and his family. Therein lies the rub with Jason as a coach: his competitive nature is almost a hindrance. Because in the end, he is simply watching from the sideline. He can push the players, try to put them in the best positions to succeed, call extra practices, and even get upset when things go poorly. But he can’t get back on the court. He can’t physically will his team to wins anymore. That is where Jason’s greatest lesson as a coach has been learned. And make no mistake, that’s what he used to do. Every stop along the way in his playing career, from high school to Cal, Dallas, Phoenix, New Jersey, back to Dallas, and finally in New York. Jason went out on the court and made his teams better. It’s a different perspective from the sideline. Granted, Jason’s had measures of success. In fact his 183-190 record over four-and-a-half seasons doesn’t do that success justice. After a bumpy start as a rookie coach in Brooklyn, J-Kidd helped right the ship and had Brooklyn playing the best basketball the Nets franchise had played since Jason’s playing days with the team in New Jersey, until they ran into the buzzsaw that was the defending NBA Champion Miami Heat in the playoffs. That was Jason’s lone season in Brooklyn. He moved on to Milwaukee, where again he helped to steer the ship in the right direction, leading the Bucks from the worst record in the league (15 wins) to a playoff appearance (41 wins) in his first season. It was that quick turnaround that Jason told Beck he believes led to his eventual departure from Milwaukee. 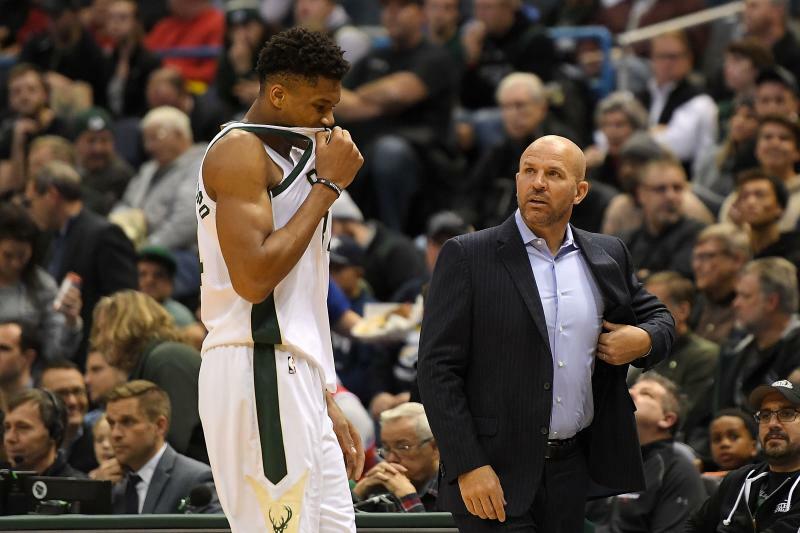 Over the next two-and-a-half seasons, marred by injuries and roster turnover, the Bucks ebbed and flowed, once again reaching the playoffs last season, but going no further than the first round. When the team started this season tracking toward a similar result, the decision was made to make a change. It’s important to note, however, that the Bucks are just 16-13 since Jason’s dismissal, and they sit exactly where they did when he left two months ago: 8th in the East, staring down another first round matchup with the Toronto Raptors. But Jason has been making the most of his first months away from the game of basketball since childhood, spending time with his wife Porschla and their children, Chance, Noah and the newest addition to the family, four-month-old Cooper. It hurts to lose, and Jason’s learned that lesson, too. He’s also learned that the game is just different on the coaching side, something he’s struggled with along the way. Throughout his playing career and into his coaching days, Jason was one of the most dedicated players in the game, putting in countless hours while acknowledging the many sacrifices that come with playing the game of basketball. So does he still have that itch? Does he still want to make those sacrifices after his recent hiatus? Jason answers Beck with an emphatic yes. But J-Kidd remains committed to doing that work, and with basketball insights like no other. He wants to prove that great players have the ability to transition to the head coach position. It seems like we will have the chance to watch him do just that, with anywhere between 6-10 teams likely to be looking for new coaches in the offseason and Jason’s name sure to come up. Where his next stop will be, he’s not sure. But there’s no doubt he’ll make it better there than it was before he arrived. That’s just what Jason Kidd does. Read Howard Beck’s full piece for Bleacher Report here.